Safe to say that I have basically spent half the day and a quarter of the evening, altering a thrifted coat. I bought it about a month or two ago, I fell in love with the lightweight fabric and more significantly, the unique fastening (I'll do a post on how it looks after I've finished altering). I paid £8 and thought it'd be perfect for those day trips that end up a little chillier near the evening or boiling hot summer days with air-conditioned malls and cafés. 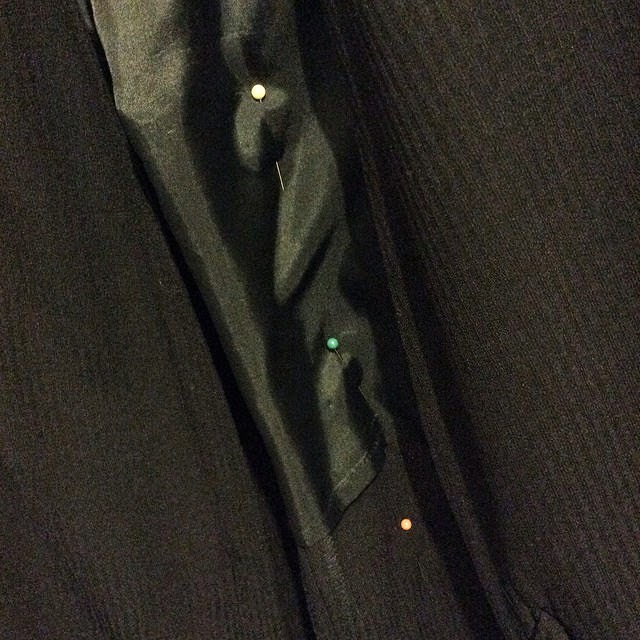 Pinned back seam of thrifted coat. You can see the pinning of the back seam in the photo, this is the culprit for the long hours (plus a movie). I had to change the pinning twice and the measuring tape is just frustrating, but after many torturous hours, I have completed the pinning. Now I'm just going to wait for tomorrow to finish it off, my eyes and fingers need a rest. Anyway, I just checked in here to let you all know that I haven't forgotten the blog and I'm also trying to find a suitable tripod, as I'm planning to start filming some DIY tutorials and other blog-related stuff. So if you have any suggestions for a good tripod suitable for filming with a DSLR, with sturdy, good quality legs and a height above or around 150cm (I'm picky, I know), please pop it down in the comments section below. P.S. I have a budget of about £30 for the tripod.